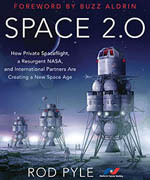 Ad Astra Downlink is the twice-monthly electronic newsletter of the National Space Society. 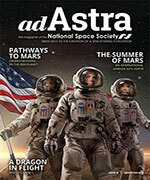 Its primary purpose is to keep our members informed in between issues of the quarterly magazine Ad Astra. Being more frequent, it also serves as a means for announcements of upcoming events not possible with a quarterly magazine. 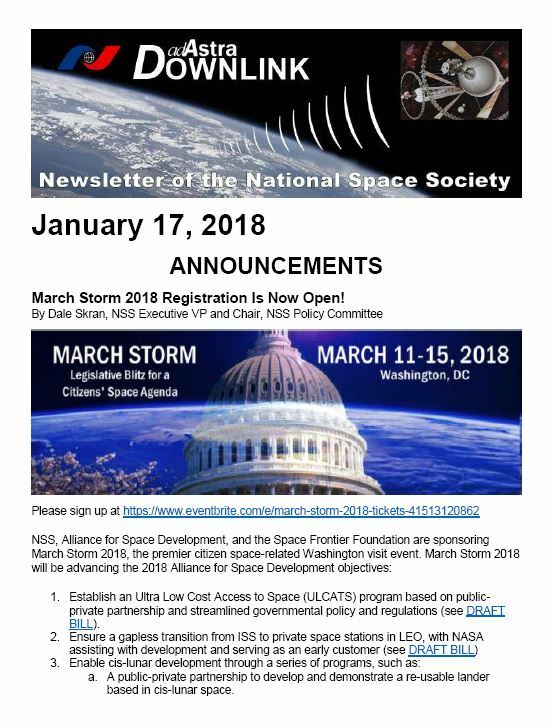 Regular features include “NSS Update” with news from NSS, “Chapters Roundup” with activities from around the world, and “Space News Roundup” covering space-related events and activities beyond the NSS. To subscribe to Ad Astra Downlink, simply join NSS as a new member. Our newsletter is a member benefit. If you are a member and would like to subscribe for the first time, contact NSS Headquarters.